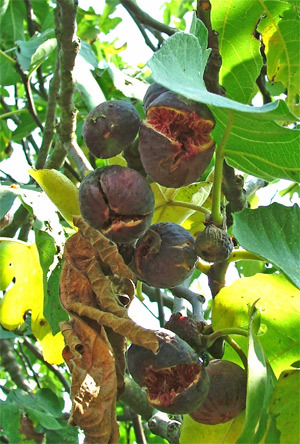 The last of the ripe, succulent figs. Two of our French connections, Raphael - specialist in renovation of old houses - and Pierre - who had found the house for us in the first place - came with us to give their opinion. Mme M. the owner, invited us for coffee and then we checked the house from room to room and from barn to barn, to see the state of the roofs, timber and stonework. Raphael brought his humidity meter, which he placed against a bedroom wall. The needle shot off the scale (it is possible to have more than 100% humidity?). The outside wall of the house is covered with a cement mix, called crépi. This keeps the rain out, but stops the walls from breathing, so our first big job would be remove it all. 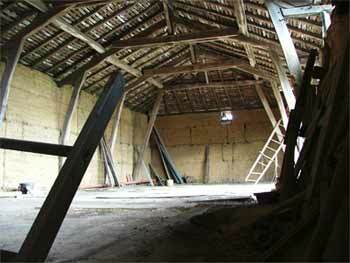 This would also entail digging out the concrete walkway around the house and the barns to put in a drainage system. (Since the houses here are built directly on the ground, without foundations, it is best to get rainwater away from the walls as quickly as possible). Pierre invited us back to his mother's house. Pulling up in front of the house, a wild cat and her tiny kittens dashed for the barn and Pierre's arthritic, old hunting dog got up and limped towards us with his tail wagging. Marie-Louise is in her seventies, small, wiry, has a few teeth and a lot of humour. The more we see her, the more she tells us about her life. So, while 'the boys' went out to admire Pierre's collection of old tractors, Caro spent 15 minutes of prime time with her. This time, they talked about life and death and how fragile she feels now that autumn and winter are knocking on the door again. At the moment she is very busy conserving all the summer goodies for wintertime, such as confit de tomates, jams and foie gras. We never seem to leave their house empty-handed. This time, it was with pâté du porc, confiture des mirabelles and a few kilos of delicious sun-ripened tomatoes. Can't a toad get any sleep around here? After several serious discussions and with Perry doing a 'Photoshop renovation' to see what a lick of paint and new shutters would do, we decided to make a bid on the house near Trie-sur-Baise. Seeing as we are not dealing through an estate agent, this whole process is more involving and complicated. We did our homework, called Mme M. and arranged a new appointment. In the meantime we have heard of another house that may possibly come up for sale. This is closer to where we are, and although it has been mostly renovated, there is still plenty to do, which will allow us to put our stamp on it. It could be that we suddenly have a luxury problem of having two houses to choose from. The agony and the ecstasy of it all! The outside of our little pavilion is alive with lizards, lounging in the afternoon sun. Elwood has suddenly discovered them and spends hours in front of the wall, interspersed with fruitless lunges up the brickwork and followed by frustrated, primeval howls. Caroline also jumped the other morning, when she discovered a praying mantis inside the mosquito net, poised just above her face. 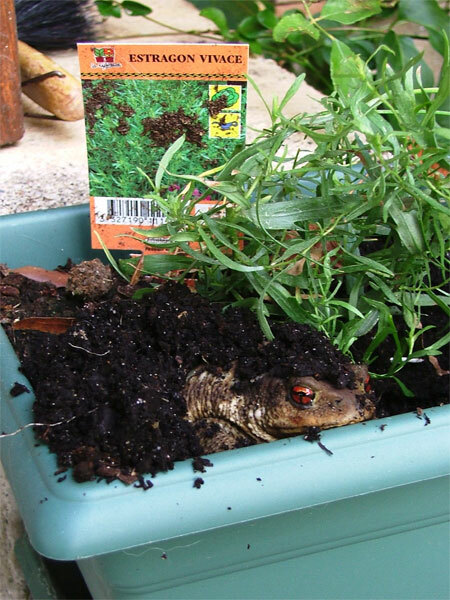 She can handle large spiders after her time in Australia, but screamed when a leaf she tried to remove from her herb pot turned out to be part of a large toad hiding in the moist soil under the tarragon. Ooh look, it's a Nezara viridula! But hey, you already knew that. 'Planning on leaving Holland for a life in France? 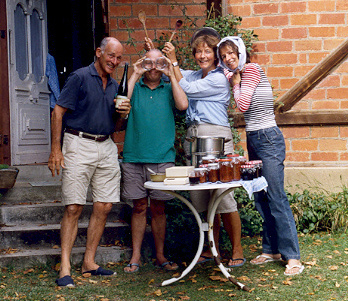 Visit Caroline and Perry Taylor's website at www.twocaninfrance.com. They have been keeping a diary since they moved to France. Sharing experiences like their search for a house, the people they meet, life so close to nature, their joys and their doubts. 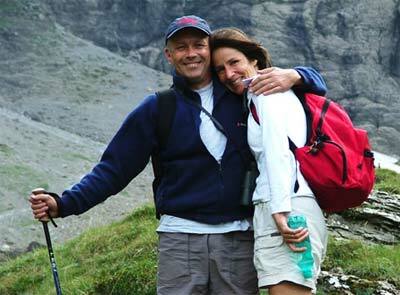 Caroline's parents arrived for a short holiday at the beginning of September. After a few days, the four of us left for the Pyrenees. We lodged in a pretty chambre d'hôtes in Beaucens, just south of Lourdes. The high, slanting roofs with their dark grey slates having replaced the warmer, terracotta tiles of the Gers. 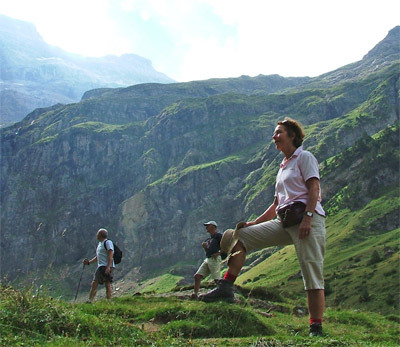 From there we took walks to the Cirque de Gavarnie, Donjon des Aigles and picnicked in nature wherever possible. It was a funny feeling for a few days, being on holiday, although we talked about the house prospects non-stop. And we slept like logs after all that fresh, mountain air. Returning to Miélan, we heard from our cat sitter that her grandparents were selling their house. It sounded interesting enough to visit, so the next day we took Caroline's parents along to check it out. The house is in the Saint Mont wine region, near Plaisance. Grandfather, a retired farmer, had a huge wine and beer glass collection in the hallway, and grandma had a private museum of full-sized dolls in the dusty attic. The house was wonderful, but far too big for the two of us (and our budget) and the neighbouring house (uninhabited, but full of cows) butted right up to it. But is was a nice experience, and pretty jolly after we all had a few glasses of Floc de Gascogne around their kitchen table. 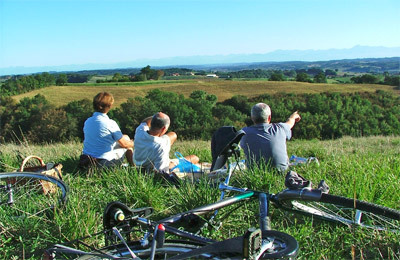 Before their departure for Holland we cycled over the rolling hills with Marianne and Peter to our favourite spot, for an evening picnic, overlooking the Pyrenees. Caroline's passport was about to expire and, instead of having to go back to Holland or to Paris, we discovered that we could renew it at the Dutch consulate in Toulouse. This is contrary to the information on the site of the Dutch embassy in France! So we made a quick dash to Toulouse, unfortunately we didn't have time to check out the city, apart from the endless and stressy search for a parking place when we first arrived. On September 22nd we celebrated our third wedding anniversary. Weeks before, we had both been sending secret e-mail messages to Caroline's parents arranging for them to buy the presents that we couldn't find here. Or more importantly, couldn't get away from each other long enough to drive to Pau and back (1 hour drive), without it being rather obvious. 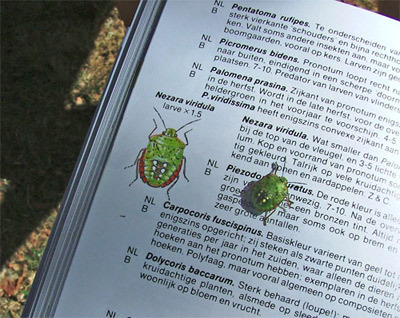 Perry now has a book which will help him recognise which insect just bit him, and Caroline has enough recipes now to be making jam and chutneys for the rest of her life. At least now she can do it to the sound of a new Acda en de Munnik CD (great lyrics if you're Dutch). The last week of September we went to see Mme M. with our proposal. After a few cagey cups of coffee we came to the point and told her how much we were willing to open the bidding. Her counter-offer was higher than what we had expected, but is all part of the game here. We walked with her around the perimeter of the property, where she warned us about one of her neighbours, who coincidentally was watching us suspiciously from a distance in his tractor. We left saying that we would return with a counter bid after having investigated our finances and all future construction plans of the area at the Mayor's office. 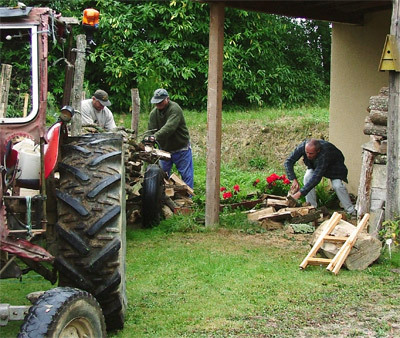 Morel started up the electric chainsaw and the metre long trunks were sawn into three, so that they could fit into the wood burner and our fireplace. The notions of safety here are very different to the 'civilised' Northern European standards. i.e. no gloves, no goggles and fingers centimetres away from the tearing teeth of the chainsaw. They cut and Perry stacked. Caroline, slipping into the French country stereotype, played her part and turned up with a big smile and a tray full of coffee for the hard working men. But being Caroline, she threw off her jacket and helped stack until the last block was placed. While we drank coffee, Morel told us about when his wife's family had lived on the land where we now rent. About the ponds, outhouses and the hunting pavilion . Later that afternoon we heard a loud rumble. Our central heating supply had tumbled down over the flower bed. Perry put the gloves on and restacked it all. Just as he was finishing, one log came loose and the whole lot came down again. Two days later, we tried again. And with success. Learning by doing. One day, we were invited to a book swap afternoon at Fran and Bill's place. They are the retired, Scottish couple that have a house on the busy road into Marciac. A nice initiative and the usual suspects were there. Wine, cheese and wise cracks, but it was a bit too 'expat' for our liking. Caroline disappeared with Barbara to the garden where they found a fully laden walnut tree. We left with a bag full of nuts and a couple of Sebastian Faulks paperbacks. We lit the fire. Once. We didn't want to give in, but it gets cold a night now. Outside it remains warm, but the pavilion has little or no insulation. 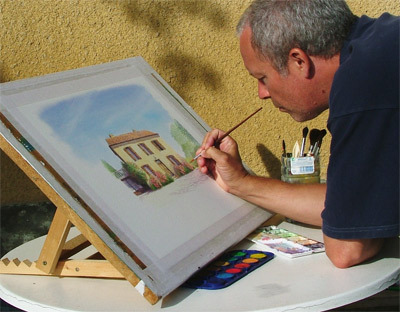 Perry started the watercolour of the house he was commissioned to do during the Jazz in Marciac. Although her husband noticed that Perry had forgotten to paint in the bell hanging next the front door, the client herself, was very happy with the result. The next day, we went to the Mayor's office near Trie. Luckily he was there and was very helpful. He showed us the land registry of the village and now we are sure that the whole village knows that Mme M. is definitely selling her property! All our homework and preparation came in handy and we left knowing that there were no plans for a factory, a motorway, or a pig farm in the area. 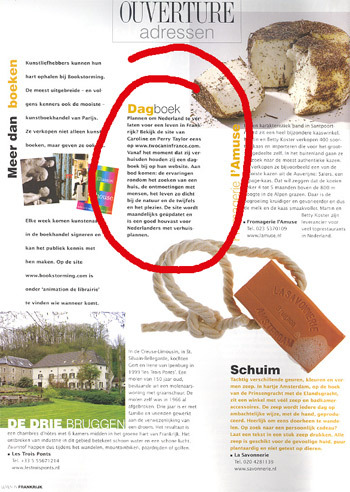 Caroline's mother called to tell us that we and our site were mentioned in an article in 'Leven in Frankrijk', a Dutch lifestyle magazine about all aspects of living in France. We knew nothing about it. But it was a very pleasant surprise. Caroline had sent an email three months before to inform them about the existence of our site but had not heard anything back. We started frantically checking and improving the navigation on the site and decided to add an archive of our older personal notes. We also added an 'About us' page for the newcomers. We hope you like it! The last Tuesday of the month, Perry went to join the drawing club at a small village with a Roman church and bridge over the Adour river. Whilst his watercolours were flowing, Caroline was busy researching the copyright laws for art and ideas. Always a tricky subject. Finally taking a break in the sun, she was immediately disturbed by a huge noise as an enormous combine harvester crossed the field and began to behead the field of sunflowers next to our pavilion. Within two hours the whole hectare was turned into an expanse of dry stumps. 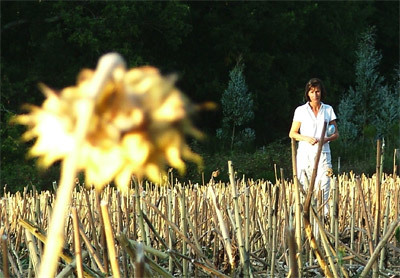 Talking to the farmer, Caro discovered that he gathers up to 10,000 kilos of seeds in an afternoon. He pulled out a retractable ladder and let her climb up to view a sea of black seeds, all shaken and separated from the chaff and the rest of the flower heads. The seeds will be pressed to become oil. Weather wise, we have had a more stable month than July and August. We hear that it will be a vintage year for the Bordeaux wines. We are also looking for more stability in our lives. It's coming. Like Christmas.